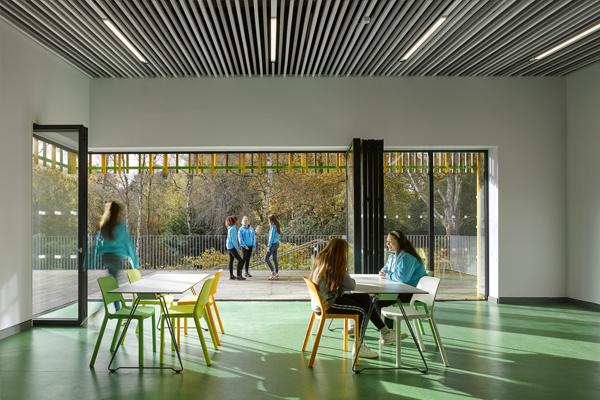 The architect behind a new Girlguiding activity centre in Cheshire was so pleased with the performance of Hunter Douglas Architectural’s innovative felt ceiling that he recommended it for the second phase of the development. John Piercy Holroyd, Associate Director of Walker Simpson Architects, specified Heartfelt® for the ceiling in the activity hall and dining room for Pettypool, the activity centre in a woodland area in Sandiway, Cheshire, commissioned by Girlguiding Cheshire Forest. When it came to overseeing the construction of the second phase of the development, he and his clients were so impressed with its acoustic performance and aesthetic qualities that it was decided to use it in the common areas of the bedroom block instead of a gypsum plank, which had been originally specified. The architect developed new graphics and colourways on the flooring to complement the 35m2 of Heartfelt® ceiling in ‘Off-white’ (7595), ‘Light Grey’ (7596), ‘Middle Grey’ (7597), and also adapted the lighting system so that it better complemented the first phase. John said unlike phase one, the ceiling in the common areas of phase two building had to cover a large amount of servicing, such as duct pipework, but it had to be easily accessible. Heartfelt® accommodates those needs easily, thanks to its simple demountable system, which demonstrates its versatility, he said. “The client was more than happy to change to Heartfelt® for the continuity of materials as well as the inherent acoustic properties as well as ease of future maintenance,” added John. The second phase of Pettypool, which has a striking steel portal frame with insulated metal-faced cladding panels and feature timber finish, accommodates eight en-suite bedrooms, each of which sleeps six occupants, as well as two leaders’ bedrooms, each of which sleeps four. There is also an accessible room for one person and a carer and includes a wet room David Harris, general manager of Hunter Douglas Architectural, said: “We were very pleased to have been recommended for the second phase at Pettypool, thanks to the overwhelmingly positive response to the Heartfelt® ceiling in the leisure area of the building. Heartfelt®, which won the prestigious Red Dot award for product design in 2017, complies with regulations for use in non-polluting buildings, is resistant to dirt and dust, meets the indoor European standard EN 15251, and EN 13501 Class B, S1, d0 fire certification. The panels are manufactured using thermoformed polyester fibres, which are 100% recyclable – earning the system C2C Bronze certificate from the Cradle to Cradle Products Innovation Institute. The panels are available in up to 6m lengths and are fixed via a special carrier system. They are available in a range of panel size, joint width and mounting height. The panels are available in: five earth tones, five shades of grey, plus black and white.